Papergreat: Scholastic book cover: "Mrs. Coverlet's Magicians"
First sentence: Mrs. Coverlet, the Persevers' white-haired housekeeper, sat down a savory roast before the three children for supper. Last sentence: But the six cats, sitting in a respectful row, looked up at their master and believed every word he said. Random sentence from middle: "For making a willow wand, for instance." About the author: Nash grew up in Wilmington, Delaware, and had a child nicknamed "Toad" who was an inspiration for the Coverlet books. 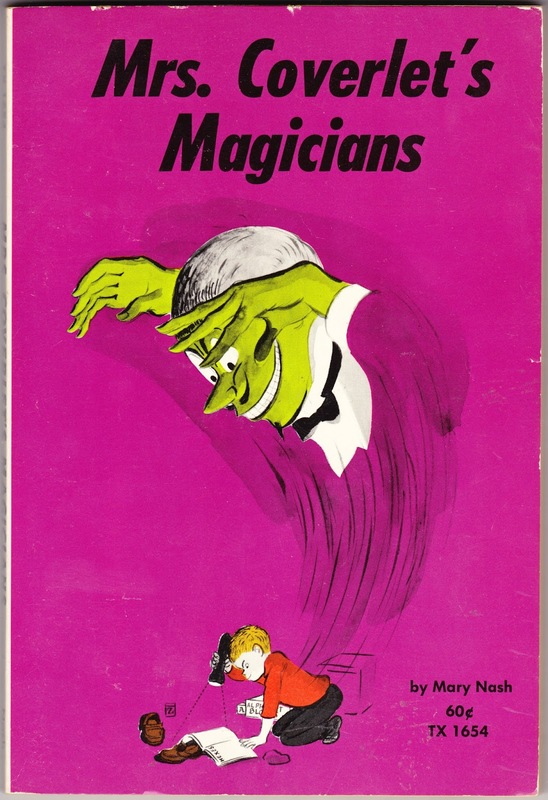 There were three books in all, with this being the middle one — While Mrs. Coverlet Was Away (1958), Mrs. Coverlet's Magicians (1960) and Mrs. Coverlet's Detectives. About the illustrator: Kansas-born Price was, early in his career, an illustrator for The New Yorker. He had a short but notable stint in the world of comic strips in the 1930s. Lambiek Comiclopedia states: "In 1933 he developed the half-page Sunday strip 'White Boy', about the adventures of a young boy who is captured by a tribe of Native Americans, eventually living peacefully with them and learning their ways." The comic strip, which eventually changed its name and focus during its short run, is discussed in great detail in a two-part 2016 article by Paul Tumey on The Comics Journal [Part 1, Part 2]. In Tumey's opinion: "The strip represents a high-water mark of the American newspaper comic, with striking visual storytelling that evokes the expansive beauty of the American West and the subtleties of the natural world."